I learned about pi-hole from Bloomberg Businessweek of all places. Seems right up my alley – uses Raspberry Pi in your home to get rid of advertisements. Turns out it was too easy and I don’t have much to contribute except my own experiences with it! When I read about it I got to thinking big picture and wondered what would prevent us from running an enterprise version of this same thing? Well, large enerprises don’t normally run production critical applications like DNS servers (which this is, by the way) on Raspberry Pis, which is not the world’s most stable hardware! But first I had to try it at home just to learn more about the technology. I was surprised just how optimized it was for the Raspberry Pi, to the neglect of other systems. So the idea of using an old SLES server is out the window. But I think I got the essence of the idea. It replaces your DNS server with a custom one that resolves normal queries for web sites the usual way, but for DNS queries that would resolve to an Ad server, it clobbers the DNS and returns its own IP address. Why? So that it can send you a harmless blank image or whatever in place of an Internet ad. You know those sites that obnoxiously throw up those auto-playing videos? That ain’t gonna happen any more when you run pi-hole. You have to be a little adept at modifying your home router, but they even have a rough tutorial for that. It prompted me for a few configuration details, but the answers were obvious. I chose Google DNS servers because I have a long and positive history using them. You can see that it installs a bunch of packages – surprisingly many considering how simple in theory the thing is. It runs a little web server on your Pi so the Pi acts as adservices.google.com and just serves out some white space instead of the ad you would have gotten. Another word about the home router DHCP settings. You have the option to enter DNS server. So I put the IP address of my raspberry pi, 192.168.1.119. What I expected is that this is the DNS server that would be directly handed out to the DHCP clients on my home network. But that is not the case. Instead it still hands out itself, 192.168.1.1 as DNS server. But in turn it uses the raspberry PI for its resolution. This through me when I did an ipconfig /all on my Windows 10 and didn’t see the DNS server I expected. But it wa all working. 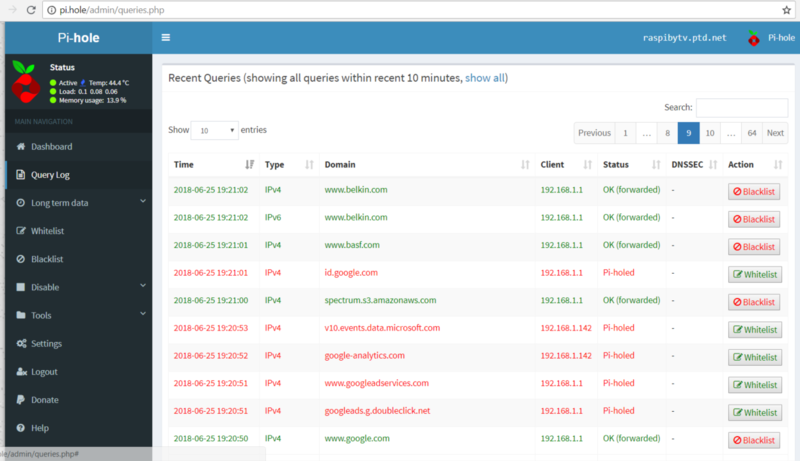 About 10% of my DNS queries were pi-holed (see picture of my admin screen above). I guess pi-hole is run by fanatics, because it works surprisingly well. Those complex sites still worked, like cnn.com, cnet.com. But they probably load faster without the ads. I checked back with pihole. I know a DNS server is running. The dashboard is broken – the sections just have spinning circle instead of data. It’s already asking me to upgrade to v 3.3.1. I run pihole -up to do the upgrade. I can now ssh to my pi by specifying the host as pi.hole – which I can actually remember! Looking for a rewarding project for your Raspberry Pi? Spare yourself Internet advertisements at home by putting it to work. Another Raspberry Pi project idea: monitor your cable modem and restart it when it goes south. This entry was posted in Raspberry Pi, SLES, Web Site Technologies and tagged curl, pi-hole. Bookmark the permalink.